During the grand media conference of the Metro Manila Film Festival (MMFF) entry “Vince and Kath and James,” actor Ronnie Alonte spilled that prior to the movie, he already met fellow star Joshua Garcia when he auditioned to join It’s Showtime’s male group Hashtags which Ronnie is currently part of. 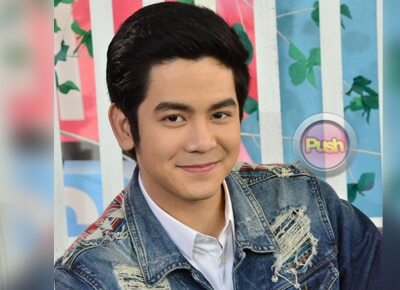 Earlier, the movie’s lead actress Julia Barretto implied that Joshua is fit for acting as he is a good actor. “Parang kinonsider lang yata siya as Hashtags tapos sinabi sa kanya, parang actor talaga si Joshua. Pang-acting talaga siya at agree naman po kami ‘dun,” she said. The young actor admitted he has learned a lot about acting since his “Pinoy Big Brother” days, thanks to the training of his management, Star Magic. "Siguro ang naitulong niya sa akin is yung mas nahulma ko yung talent ko, mas marami akong natutunan tulad ng acting. Kasi nung pumasok ako hindi naman talaga ako marunong umarte. Naituro nila yung kung ano pa yung makakaya ko,” he explained. Set to open on Christmas day, Star Cinema’s Vince and Kath and James, which was based on the textserye Vince and Kath, is Joshua’s first movie entry to the MMFF. He is also paired with Julia for the first time.